Historical photos from the 1940s and 1950s, show no bridge between what would eventually be the Northeast Park and Shore Acres neighborhoods as those neighborhoods did not exist. The Shore Acres and Northeast Park Neighborhoods were developed in the early 1960’s. A crossing was designed and built to cross Placido Bayou along 40th Avenue NE. The Nathanial J. Upham Bridge, named after a founding resident of the area, was finished in 1961. Formerly a banker, Mr. Upham entered the real estate business in 1889, forming N.J. Upham and Co. with his brother T.H. Upham. Later in his career, Mr. Upham divided his time between Duluth, MN and St. Petersburg, FL where he maintained an interest in various real estate investments. He was President of the National Association of REALTORS® in 1922. This bridge (number 157154) remained in continuous service through 1990, when It was widened from two to three lanes. For the next 17 years, the bridge served as an important link connecting popular residential neighborhoods and the communities matured and flourished. Routine inspections every two years showed that the span was showing some signs of age, but remained a viable crossing. In 2016, an independent study prioritized the bridges within the City of St. Petersburg for replacement over a ten-year period. At that time, the 40th Avenue NE Bridge – based on routine inspections – was not ranked in need of complete replacement. However, the bridge was in need of routine maintenance. It was also in need of being raised, according to a growing number of area residents and boaters who organized the “Raze and Raise” the bridge initiative. In August 2017 concrete repairs were underway and while removing loose concrete, the extensive corrosion of the reinforcing strands in the underside of the bridge center was discovered. At that time, the bridge was temporarily closed and re-inspected. Based on the inspection findings, it was determined that the bridge could be safely reopened if traffic modifications were made to take traffic off of the center of the bridge. 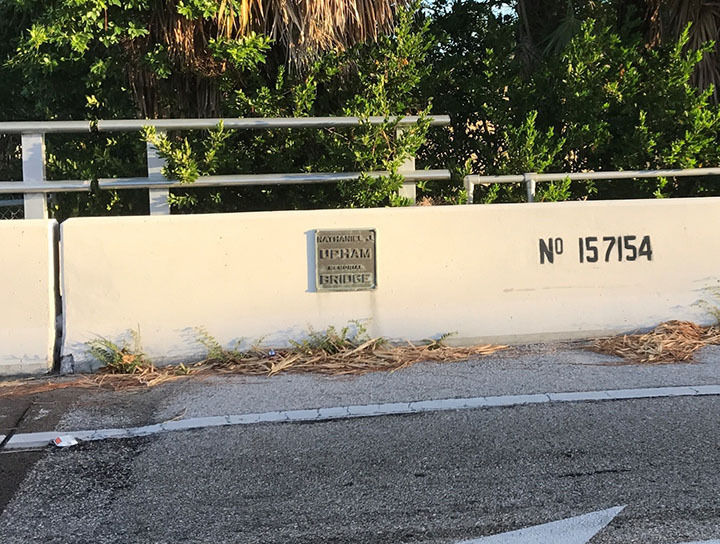 These modifications included shifting vehicular traffic from the center of the bridge where the corrosion occurred to the outermost edges, reducing travel speed and increasing weight restrictions. These modifications are daily reminders that this bridge is due for a much-needed replacement. © 40th Avenue NE Bridge Replacement. All images and content are copyright of 40th Avenue NE Bridge Replacement and can not be used, replicated or reproduced without written permission.